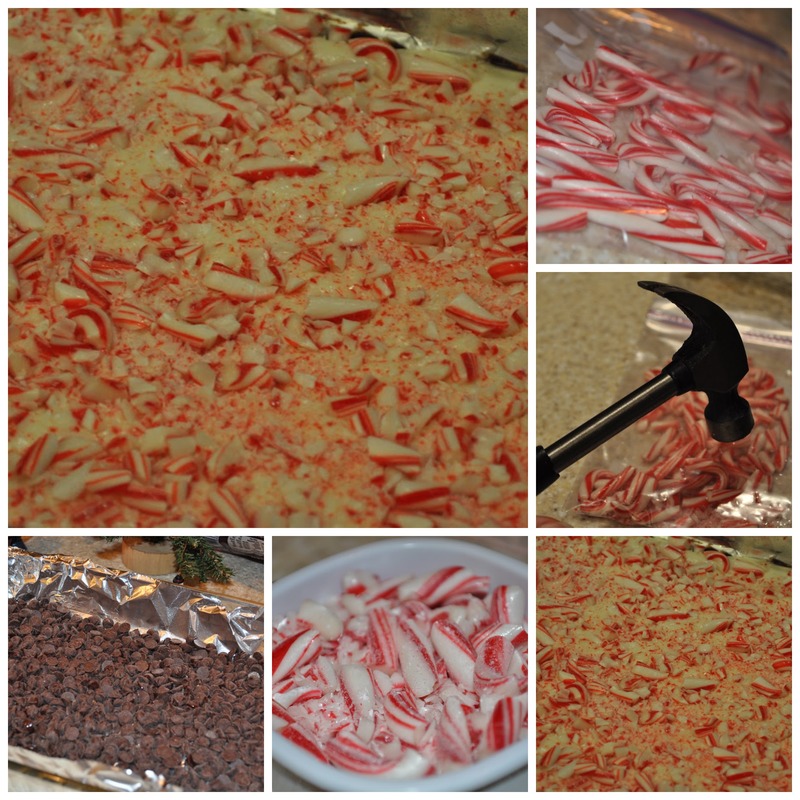 Making Peppermint Bark is a holiday tradition in our household. This is a simple and easy Peppermint Bark Recipe and my kids adore making it with me too! Even better, it’s a fantastic garnish to decorate my cookie trays plus, I typically will gift it to friends and family. This recipe really is easy but is a bit time consuming as you need to CRUSH your candy canes and follow some careful directions to melt and cool your chocolate correctly.It only requires 4 ingredients which is awesome. You can pick up all these at your local Walmart or since it’s the holiday season, you may already have everything you need at home. This recipe makes about 2 lbs of chocolate. It will also take a good 30 minutes to prepare. Preheat oven to 250. Line a 9×13 pan with foil – allow the extra to hang over the sides. Spray your aluminum foil. Pour the chocolate chips in an even layer on the foil. Heat in the oven for 5 minutes or until ALMOST melted. Remove from oven and smooth into a layer of chocolate across the pan. Step 2. Place in refrigerator until cold and firm. 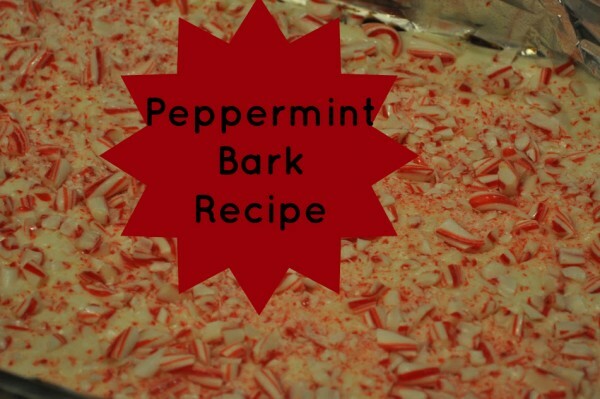 (About 20 minutes) While this is cooling in the fridge, crush your Peppermint Candy Canes. I use a hammer and place the candy canes in a ziploc bag to crush them. Works for me! Step 3. Creating the White chocolate layer Note: ALMOST melt your white chocolate in the microwave. This takes a few minutes and will require checking on the chocolate as it is softening and almost melting. I can’t give you a perfect time to bake as you really need to see how it feels as every microwave cooks differently. When it is almost melted, remove from the microwave and quickly stir in your peppermint extract. Stir until it seems like your chocolate is truly almost melted with the peppermint extract mixed in nicely. Step 4. Allow your white chocolate layer to cool for a few minutes. Step 5. Pour the white chocolate mixture on top of your cooled chocolate layer. Work quickly and spread it out to cover the dark chocolate layer. Note: You don’t want your White Chocolate to MELT your dark chocolate layer, thus be sure you aren’t pouring BOILING white chocolate onto the 1st layer. This is the trickiest bit of the entire process. So be sure you have cooled that white chocolate layer a bit and also kept your dark chocolate layer in the fridge for a good 20 minutes so it has hardened some. Step 6. Pour this over chocolate layer, and, working quickly, spread to cover. Step 7. Sprinkle with crushed Peppermint Candy Canes. Step 8. Chill until both layers are firm. Step 9. Using the foil, lift the entire concoction out of the pan and shake off your excess peppermint. Step 10. Cut into 1-3” wide strips or whatever size you’d like. Peel the bark from the foil. This can be tricky to separate – so be patient. Step 11. Store and chill in a covered container. I favor the actual helpful tips a person source to the reports. Let me take a note of your website look just as before below often. Now i’m considerably certain I’ll be shared with a lot of completely new goods proper listed here! Have fun for!